Alternate Headline: Best budget optic that I have seen thus far. Yeah, thats right… I was extremely impressed with this micro red dot, and it may indeed be the best budget optic out there – red dot or otherwise. As I mentioned back when I recently reviewed the Aimpoint Micro, I have logged a good bit of trigger time with what seems like the entire spectrum of red dots. From the el cheapos to the higher dollar combat ready models to just about everything in between. This red dot really made me step back and take notice. No, its not an Aimpoint, but for less than $100 (Yes, you read that right) this is an amazing little sight that will do just about anything that you would need this side of Afghanistan. 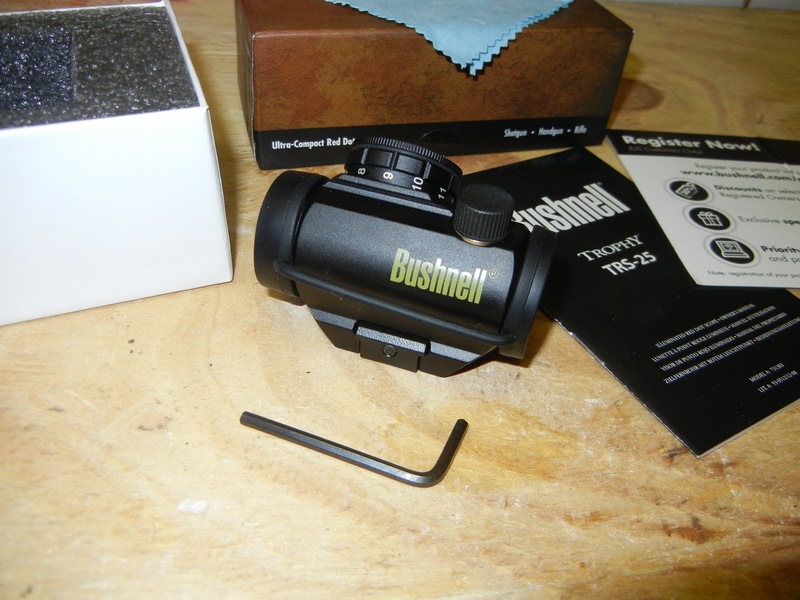 The Bushnell TRS-25 is a 1x magnification low-cost alternative to the Aimpoint Micro. Its something that would be an excellent addition to any rifle, shotgun or handgun. It features a 3-MOA dot, multi-coated optics, is dry hydrogen filled, and its waterproof to a depth of ten feet. My first impression upon opening the box was that the TRS-25 seemed like a pretty solid little unit. Fit and finish are nice enough, and it seems well made… when you consider the fact that this is a sub-hundred dollar red dot, it really seems like it is in fact over engineered. Included with the sight is a set of bikini style lens caps styled after the kind that come with the Aimpoint… and they are pretty much right on par with what you get when you buy an Aimpoint Micro. They are great. They can be just slid down to straddle the sight while being used or simply removed completely and set aside somewhere safe (I prefer the latter). They too are well made and should last just as long as the sight will. After the initial fondling and obligatory photo shoot, I headed over to my postal scale to see where this thing would weigh in at. Weight of the sight comes in at 3.9 ounces on my scale (thats only 1.1 ounces heavier than the Aimpoint weighed in at). Astonishing. Test firing with the TRS-25 would prove the optic to be something special. No, I didn’t do any extreme torture testing with this optic… mainly because I didn’t have access to a helicopter from which to throw it out of, but more so because it wouldn’t really be fair to try to take a sub-hundred dollar optic and combat test it the way you would with a purpose built red dot that has been designed from the ground up to take that kind of abuse. Thats not really the target market that this optic was intended for. What I did do with this optic was put it through several different range sessions and approximately 500 rounds of 5.56. After getting it initially sighted in there was no loss of zero… ever. I removed and replaced the optic from the rail of my Daniel Defense DDM4 after each and every range trip and not once did it have any effect on it’s zero. I will say that although I did not have the intention of abusing the optic, I did have one incident in which my rifle did experience a fall from waist height with the optic attached. The rifle did not land on the optic, but it of course did rattle around a good bit after the rifle hit. Surprisingly, the optic was no worse for wear (nor was my rifle, thankfully), and there was absolutely no effect to its zero. The optic runs on one CR2032 battery, and battery life is going to come in somewhere between 1,000-3,000 hours depending on which brightness setting you are using. I will say, that this is a very bright red dot and it can be easily seen even in the brightest of mid-day sun conditions. Thats the one deciding factor that I have found where most budget red dots fail the test. I preferred to use this optic on setting 5 in low-light and indoor conditions, and setting 11 in sunny outdoor conditions. Realistically, you could use this indoors on the 2 or 3 setting (I did at one indoor range session) and outdoors in the bright sun on as low as setting number 7 or 8. Your eyes and preferences may vary, but this red dot is certainly capable even in the brightest of conditions. The glass is nice. Its noticeably not as clear and perfect as the Aimpoint, but it is certainly good enough. There is a slight light-blue tint to the glass which is kind of weird the first time you look through it, but during live fire its not even noticeable. I will say, that for the glass not to be a deal breaker on a sub-hundred dollar optic is a major accomplishment. Another thing that really stands out about this optic is its windage and elevation adjustments. They are pretty darn exact. I dont know for sure the exact value of each turn, but they are precise and they also have very positive click positions with each turn. The turret caps as well as the battery compartment are also o-ring sealed for added protection from the elements. The optic comes “centered” from the factory, so its not difficult at all to get a precise zero with any particular firearm. Ok, so lets talk about the mount for a moment… This TRS-25 red dot is not drilled and tapped on the bottom to allow for the use of risers and mounts like the ones that the standard Aimpoint Micro can use. Instead it needs to be mounted on a riser that has a Picatinny rail top. 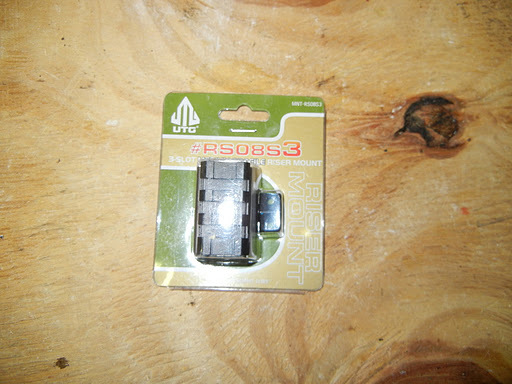 Thats where the UTG 3-Slot Medium Profile Riser Mount (#RS08S3) comes in. 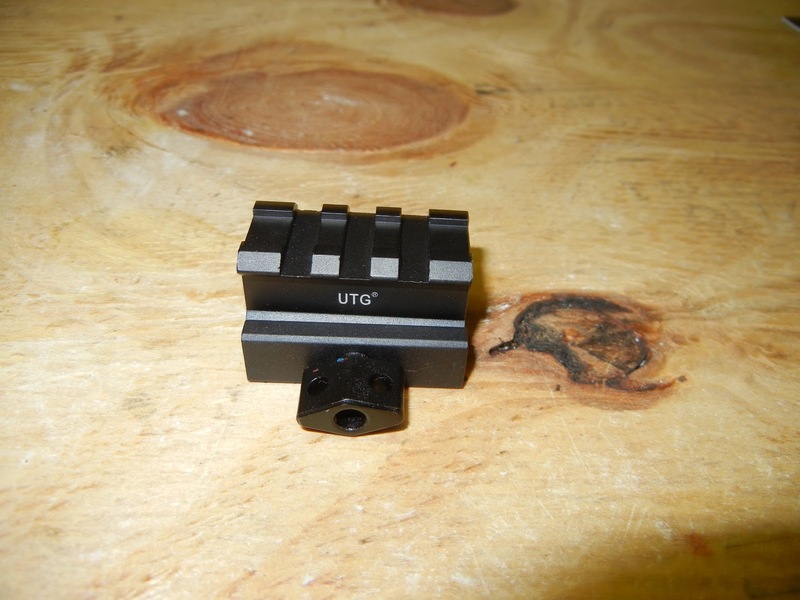 This is a 0.83″ height mount and it gives the optic a perfect co-witness with the iron sights (For 1/3 co-witness, use the UTG 1″ high profile mount). This mount is made of aircraft grade aluminum and weighs in at a miniscule 1.6 ounces on my postal scale. It is surprisingly well made and does a wonderful job of securing the sight and maintaining zero. 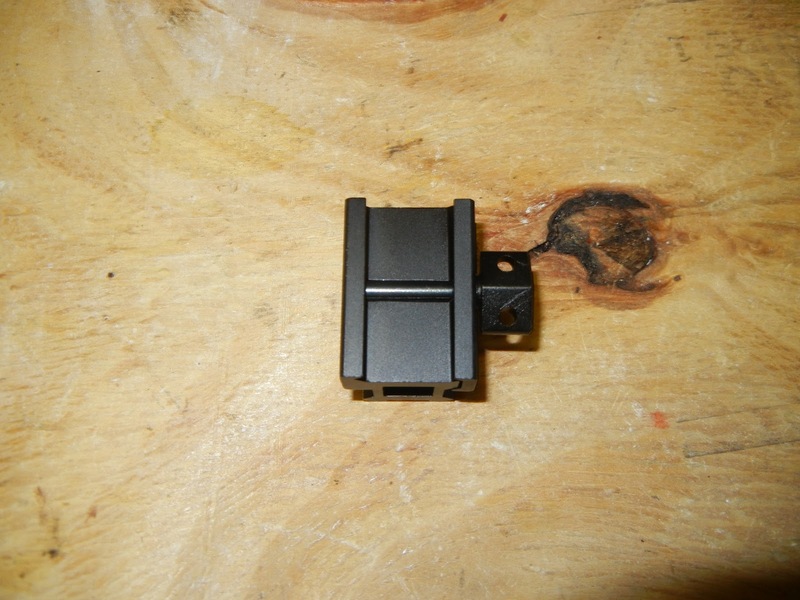 Oh… and did I mention that this mount can be found online for as little as $10? Yes, I said $10! The mount attaches to the rail by means of a side-plate clamp with a spring tension screw. Basically, you just tighten down the screw with as much hand tension as possible and it holds just fine. I muscled it really good, and found that it holds everything together great. Then to remove the mount, just muscle-up again and it can be removed without the need for any tools. I wouldn’t really call it a “quick release” mount… more like a “field expedient” mount. Once again, this is not a mount that I would choose if I were going off to Afghanistan, but for just about everything state-side its gonna do the job just fine. It has served me well thus far, and I don’t have any problems to report whatsoever. So there you have it. This is one heck of a sight and the mount is great too. When you consider the fact that if you scour the far reaches of the Internet, you can probably find both the sight and the mount for +/- $100 its truly amazing. I was really blown away by the entire package, so much so that I thought it had to be a fluke. I thought for sure that I had gotten a one-off wonder sight that was simply too good to be true. So I decided to turn the Google-machine loose and see what the rest of the Internets had to say about this sight and if my experiences were the exception to the rule. I was once again pleasantly surprised to find that my experiences with this product were indeed common place. In fact, I could not find one single negative review… anywhere. I checked the major online retailers, the forums, the blogs, and everywhere in between. Not one person had anything bad to say about this micro red dot. All of the experiences were positive, and many reviewers were stating that they were going back to buy multiple TRS-25s to put on other guns (I may very well do the same). Many were even reporting that this sight was routinely standing up to 12 ga. buckshot and deer slugs. Impressive. 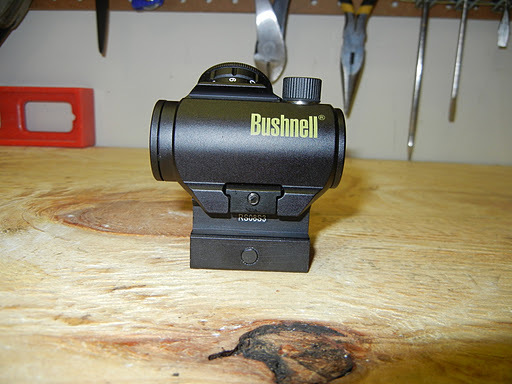 So if you are looking for a budget red dot, then the Bushnell TRS-25 is one that wont disappoint. No, its not a Aimpoint. If you are heading off to Afghanistan to fight the Taliban then put an Aimpoint on your rifle. If you and your rifle are going to be staying state-side, then this may very well be the red dot for you. UPDATE: From the comments section, RTB reports that he has owned one of these for about a year now and has had almost the same great experience.